Call Today to Schedule an Eye Exam! Are you due for an annual eye exam but are looking for a new optometrist? Are you contact lenses bothering your eyes more than they should? Quality eye care is just a phone call away in Fayetteville, NC! Call Katherin Johnson OD today! When it comes to your family's vision, who do you trust? Make it Central Carolina Optometry. With a reputation for excellence and convenience, we're your source for everything from contact lenses to your next eye exam. When it comes to optical health and clear vision, you can rely on Katherine Johnson, OD and her staff at Central Carolina Optometry! We've found that the key to great eye care is, simply put, to be genuinely caring, and that's what we do at Central Carolina Optometry. If you need an eye exam, contact lenses, or more involved forms of eye care, call today to schedule an appointment. For eye care of the highest quality in the Fayetteville, NC area, people know that there's only one destination. If you need anything from eye care to a great price on contact lenses, Central Carolina Optometry is here to for you. Your eye exam will do more than just check the strength of your vision. 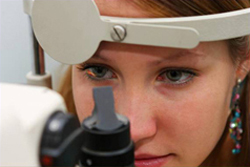 Central Carolina Optometry is capable of screening for a wide variety of optical diseases and disorders, like glaucoma, cataracts, and even diabetes. Because of this preventative screening for degenerative eye diseases, we suggest that everyone schedule a routine eye exam at least once every 1 to 3 years. You should schedule an exam more frequently if you are having a lot of vision issues. When you come to our office for your eye exam, you get more than just a routine checkup. You get caring, comprehensive care that only a skilled optometrist like Dr. Katherine Johnson of Central Carolina Optometry can provide. Get fitted for new contact lenses! For those that don't like eyeglasses, there is another convenient option for you! Let us fit you with quality contact lenses. Katherine has been serving the people of Fayetteville, NC for years, and she can fit you with contact lenses that will be comfortable while correcting your vision. And she'll do it all for a great price. It doesn't get any better than this! After all, you can't afford to trust anyone less than the best with your contact lenses. You'll be wearing these lenses all the time, trusting them to not only correct your vision, but to stay comfortable and in place for long periods of time. Only an eye care professional like Central Carolina Optometry can give you the peace of mind you need when you're ready to spring for new contacts. Make an appointment today and find out for yourself! Our entire staff provides comprehensive cornea and contact lens care that you're just not going to get anywhere else throughout Fayetteville, NC. Upon evaluating your eyes and determining which form of lens may best suit your individual needs, we'll help you gain the finest rates on your selected products. Custom lenses to correct your vision! Whether you prefer soft or ridged contact lenses, you can trust that we offer all the top names in the industry. We can also prescribe custom designed contact lenses for special needs as well as special eye problems. 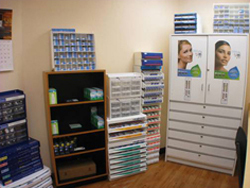 Obtaining high quality eye care and contact lenses has truly never been simpler! Just dial 910-491-9086 the next time you require an eye exam, and schedule an appointment at this unbeatable Fayetteville, NC practice. Central Carolina Optometry will have you in a fresh new pair of contact lenses before you know it! Katherine Johnson, OD offers top-quality eye care services to Fayetteville, NC. From a routine eye exam to glaucoma treatment and more, Central Carolina Optometry is the place to visit. If you need contact lenses or other eye care services, call our offices today and schedule an appointment for an eye exam!